The American College of Sports Medicine (ACSM) released its report on fitness trends last month. The tenth report on the subject named wearable technology as the biggest trend for 2016. Wouldn’t you agree? Most likely you know someone who sports a Fitbit, a Jawbone, or other device. It may have even helped that person reach a goal of losing weight or just being more active. I started wearing a Nike Fuelband all day, everyday in December 2013 (until it died in December 2014) to make sure that I remained active during my recovery and beyond. My email inbox shows that this trend is in full force — at least according to manufacturers. Once a month, I get invited to test a new wearable or fitness tracker. Last week I went to two events for new improved bands, Microsoft Band 2 and Tom Tom Spark GPS Watch, and during the month of August I tested the Mio Fuse. 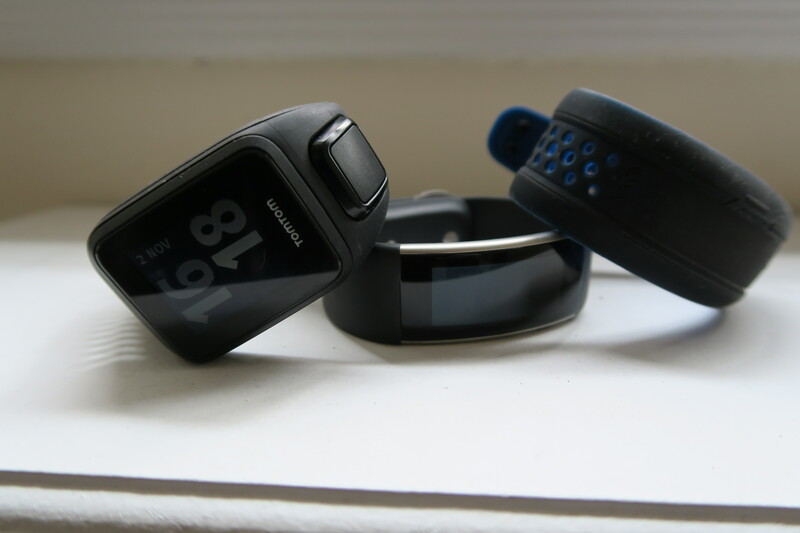 Reviews for the Microsoft Band and Tom Tom are coming soon. UPDATE April 2016: The review for the Microsoft Band 2 is here. But whether this trend will last remains to be seen. While researching an article about fitness trends that stand the test of time, I interviewed Walter R. Thompson, PhD, FACSM, the lead author of the survey and associate dean in the College of Education & Human Development at Georgia State University in Atlanta. He told me that the less technology involved, the more lasting power a trend has. Wearables may buck that notion. “Consumer interest in fitness technology may signal that the low-cost, DIY exercise trend is waning,” he said in a prepared statement about this year’s report. Ultimately, a fitness tracker is only as helpful as how you use it. Here are four tips on how you can get the most from your fitness tracker. I am curious: How many of you are wearing fitness trackers? Which one do you sport? And why do you wear it? Leave your answers in the comments. I’ve been a fan of Basis’s fitness trackers ever since the B1. It definitely doesn’t have as nice of an app interface as the Fitbits seem to, but I think it is still more accurate and useful. I wear it for 24/7 heart rate and sleep tracking mostly. The thought was that would improve my overall well-being better than say a Garmin or Polar that might only be good for when I decide to run. I think the key is to find one that you like. Once that happens, you can figure out for yourself the best way to use it. I’m glad you found your fit. And I guess like you mentioned in your tips one of the main things is just staying motivated. What has been your main goal with fitness tracking? Making sure I move since I am a desk jockey.